Britons are increasingly tech-savvy but are still bamboozled by tech jargon. So while 40% of online Britons receive news feeds, 67% did not know that the term for this service was Really Simple Syndication (RSS). Acronyms in particular foxed users. 75% of online Britons did not know that VOD stands for video-on-demand, while 68% were unaware that personal video recorders were more commonly referred to as PVRs. Millions of people keep in touch via instant messaging but some 57% of online Brits said they did not know that the acronym for it was IM. "The technology industry is perhaps the most guilty of all industries when it comes to love of acronyms," said Mr Burmaster. "There is a certain level of knowledge snobbery in so far as if you talk in acronyms you sound like you really know what you are talking about and if others don't understand then they are seen in some way as inferior," he said. Terms such as blogging and podcasting have achieved a high enough level of exposure to have made it into dictionaries but there are still plenty of people who don't understand the terms. 35% of online Brits had heard the term podcasting but didn't know what it meant and a quarter had never heard of it. Similarly with blogging, 34% said they had heard of it but weren't sure what it meant. "Some of the figures surprised us," said Mr Burmaster. "It is important to remember that this is a survey of people who are already online so the numbers among the general population will be even higher." Regular surfers are, according to the survey, gadget-hungry. Interestingly, although 68% of those interviewed possessed an MP3 player, only 20% owned iPods - the biggest selling digital music player. 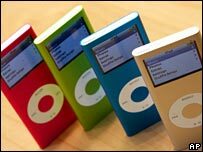 The iPod may be less popular with surfers because there are fewer online music stores from which music can be purchased, said Mr Burmaster. "The whole ethos behind the internet is about open access and for people already online, being able to access music from a variety of sources is important," he said.